Abstract. Breaking internal waves play a primary role in maintaining the meridional overturning circulation. Oceanic lee waves are known to be a significant contributor to diapycnal mixing associated with internal wave dissipation, but direct measurement is difficult with standard oceanographic sampling methods due to the limited spatial extent of standing lee waves. 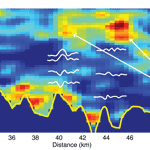 Here, we present an analysis of oceanic internal lee waves observed offshore eastern Costa Rica using seismic imaging and estimate the turbulent diffusivity via a new seismic slope spectrum method that extracts diffusivities directly from seismic images, using tracked reflections only to scale diffusivity values. The result provides estimates of turbulent diffusivities throughout the water column at scales of a few hundred meters laterally and 10m vertically. Synthetic tests demonstrate the method's ability to resolve turbulent structures and reproduce accurate diffusivities. A turbulence map of our seismic section in the western Caribbean shows elevated turbulent diffusivities near rough seafloor topography as well as in the mid-water column where observed lee wave propagation terminates. 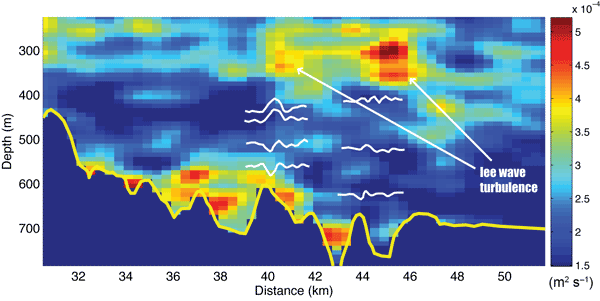 Mid-water column hotspots of turbulent diffusivity show levels 5 times higher than surrounding waters and 50 times greater than typical open-ocean diffusivities. This site has steady currents that make it an exceptionally accessible laboratory for the study of lee-wave generation, propagation, and decay. How to cite: Fortin, W. F. J., Holbrook, W. S., and Schmitt, R. W.: Mapping turbulent diffusivity associated with oceanic internal lee waves offshore Costa Rica, Ocean Sci., 12, 601-612, https://doi.org/10.5194/os-12-601-2016, 2016. Lee waves play a significant role in ocean mixing but are difficult to study with traditional casts, moorings, and tows due to their stationary nature and limited spatial extent. We develop a new method to estimate turbulent diffusivity from seismic data and find elevated levels of turbulence associated with lee waves in the mid-water and around the seafloor that are 5 times greater than surrounding waters and 50 times greater than open-ocean diffusivities.